Would you know how to save the life of a loved one? Chances are you will be the first on the scene of an accident, or the only person able to assist in the event of an emergency. It could be at work, while driving or in your own home. At St John Ambulance NT we can teach you the life saving first aid skills that can make a difference in those first few minutes. First Aid training is an essential skill for life and anyone can complete a course. There is no minimum level of fitness required . You never know when you may need these skills. Early intervention has been proven to save lives and to reduce recovery time from injuries. It takes only 4 minutes for a road accident victim with no serious injuries to die from a blocked airway. It can take up to 10 minutes for an ambulance to arrive at the scene of an accident. “First Aid – It Saves Lives on the Road”, Global Road Safety Partnership 2003. 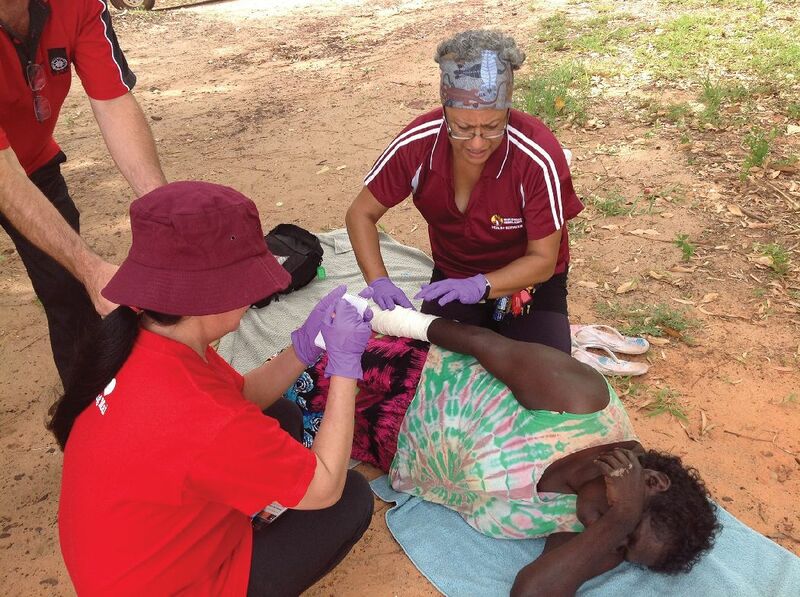 Only 1 in 20 people in the Territory currently have the first aid skills to save a life. St John Ambulance Australia NT Inc Training Statistics 2011. Inexperienced and young drivers have approximately 3 times the rate of road crashes and fatalities of older drivers. Novice Drivers DVD Booklet, Northern Territory Government 2008. 57% of deaths on the roads occur within a few minutes of the crash at the accident scene. “First Aid in Action – 10” European Reference Centre for First Aid Education. 2002. First Aid has always been a vital part of an effective emergency response and St John Ambulance NT is proud to train and certify over 10,000 Territorians each year in first aid. If you’ve never done First Aid training, or can’t remember your last course, now is the time to refresh your first aid skills. Call us today! Why train with St John? We have been training members of the Territory Community for over 50 years. We have qualified trainers who make the training experience an enoyable, relevant and valued learning opportunity. We are delivering the latest HLTAID units of competence containing the most up to date information and skills. We offer a wide range of first aid courses to suit various training requirements and can deliver the training at either our premises or alternatively, yours. We offer Online learning which is accessible prior to attending a one day face to face workshop. To start your first aid journey visit www.stjohnnt.org.au/training where you will find all of the course options available. Our most popular course is the HLTAID003 Provide First Aid course held each week at various locations across the NT, so contact us today to book the course that suits you. St John-NT would like take this opportunity to thank our loyal and valued customers and supporters who financially support our organisation through the purchase of goods or services. Your support ensures that our volunteers are able to continue to serve the local community at the many sporting, community and family events held across the NT each year. For further information on training courses or any of the services offered by St John Ambulance NT please visit our website www.stjohnnt.org.au or call us today on 89226200.